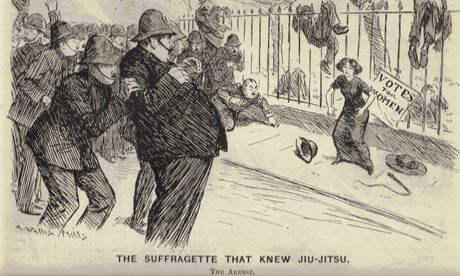 One Edwardian woman who certainly didn’t let fashion hobble her was martial arts expert Edith Garrud. Her ju-jitsu skills made a mockery of would-be muggers and over-assertive policemen alike. She kept wooden clubs in her hand-warming muff. If she sweetly dropped her handkerchief in the street it was as a prelude to a devastating bit of self-defence. Undaunted by the contrast between the demands of appearance and the demand for political representation, both militant and non-violent suffragists learned to use their clothes as part of a series of battle tactics. For example, women who were dressed impeccably could pass without suspicion into public spaces or political meetings. Once in place they could whip chalk from their purses to scrawl slogans on pavements; they could pull chains from their handbags to secure themselves to railings, in order to have their say while someone searched for bolt-cutters. ‘Slasher’ Mary Richardson even concealed a small axe in her blouse sleeve, ready to attack Velasquez’s painting, the Rokeby Venus, at the National Gallery. You can read the rest of this article on the intersection of suffragism and fashion via the Edwardian Promenade website. A short documentary covering the origins of the radical Suffragette movement in England. The exercise of club-swinging was first introduced to Europe during the late 19th century, by British soldiers who had observed similar exercises performed by wrestlers and other athletes in India. By manipulating the clubs in complex swinging and flourishing patterns, exponents were able to develop their co-ordination, strength, endurance and flexibility. Club-swinging spread throughout the Western world via public gymnasia, military physical training courses and physical culture classes offered in schools. A “flourishing” trade also developed in home study manuals, further establishing Indian club swinging as a fitness craze that lasted through to the early-mid 20th century. In 1914 it was announced that members of the newly-formed Bodyguard society of the Women’s Social and Political Union (the militant British Suffragettes) would be armed. Although it was speculated that they would be carrying pistols – a prospect that considerably alarmed the police – their actual weapons were Indian clubs, which they carried concealed in the bustles of their long dresses. The Bodyguard developed a number of uses for their new weapons. To counter the common mounted police tactic of backing their horses into groups of suffragette protesters, a woman named Mrs. Haverfield came up with the trick of striking a horse behind the knee joint with an Indian club. The horse would not be hurt but it would sit down quickly, dumping the mounted constable off its back. Other Bodyguards observed that, because police constables were required to pay for lost equipment out of their own wages, they were inclined to stop fighting and run to retrieve helmets that fell off during scuffles. Therefore, simply knocking off a constable’s helmet with an Indian club would sometimes be an effective delaying tactic. Bodyguard trainer Edith Garrud recalled an incident in which the suffragettes used their clubs en masse as weapons of intimidation. Mrs. Emmeline Pankhurst, recently released from prison to recover from her latest hunger strike, was leading a secret meeting in a building owned by Mrs. Despard, who was a wealthy and prominent supporter of the cause. When the police arrived to re-arrest Mrs. Pankhurst under the “Cat and Mouse Act”, Edith quickly took charge of the situation, arming all the women present with pairs of Indian clubs. The suffragettes then formed a club-swinging cordon around their leader, processing out of the building and blocking the constables’ attempts to reach her until she could be safely delivered into a waiting cab.